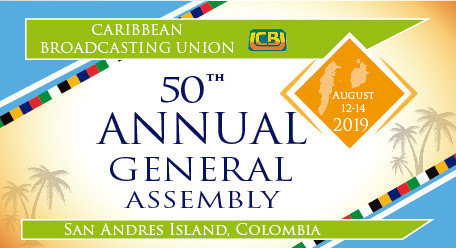 The President and Board of the Caribbean Broadcasting Union (CBU) are pleased to invite you to the 50th Annual General Assembly (AGA) taking place at the GHL Sunrise Beach Hotel, in San Andres Island, Colombia from August 12 to 14, 2019. The theme of this year’s Assembly is – Caribbean Media: Uniting the Region through Indigenous Content. As shown in the Draft Conference Schedule, this year’s CBU Assembly will include highly-relevant sessions for the entire regional media sector. The best of the media offerings from the region will be celebrated at the Caribbean Broadcasting Awards gala, on the evening of Tuesday, August 14, 2019. In addition, all delegates are invited to participate in the associated events, designed as opportunities to enjoy the rich culture and beauty of Colombia. The CBU is pleased to announce its partnership with COPA Airlines, the official airline of the 2019 Assembly. Member and non-member delegates to the Assembly will receive a discount on return flights. The discount code will be issued to participants upon registration. The main conference venue will be the GHL Sunrise Beach Hotel, which will host the official Opening Ceremony on the evening of Monday, August 12, as well as the main conference sessions on August 13, and the Members’ Plenary on August 14, 2019. Registered AGA delegates will receive complimentary Wi-Fi, conference bags, coffee breaks and lunch on conference days. For more information about this year’s Assembly, contact the CBU Secretariat info@caribroadcastunion.org or (246)430-1007.